I have had the desire to study the book of Romans for quite some time, but each time I start I end up getting off track due to the need to study other things for my job and ministry or just because of life. But verses or passages of this book keep popping up and the desire is stirred up again. So now, I have decided to do a complete study of this whole book, no matter how long it takes. If I get side tracked I'll just pick it up again. I think God has something for me in studying this book. One thing I know, I'm drawn to the theme of God's mercy in this book, and I think it's something I need to reconnect to on a deep heart and soul level as I come into my 30th year of following Christ. I started my study of the book of Romans with the intention of studying chapter 1 verses 1-7. However, as is often the case for me, I got stuck on one word in the first verse and off I went on a journey of discovery. In his introduction Paul is presenting a brief resume to the Roman Christ-followers - a group of people he has never met in person, but who have a place deep in his heart. The people of the Roman church were predominantly Gentile and Paul, having been called to reach the Gentiles for Christ, feels a strong responsibility that they understand their place as a part of God's people. He also laying the groundwork for them for a visit from an apostle. 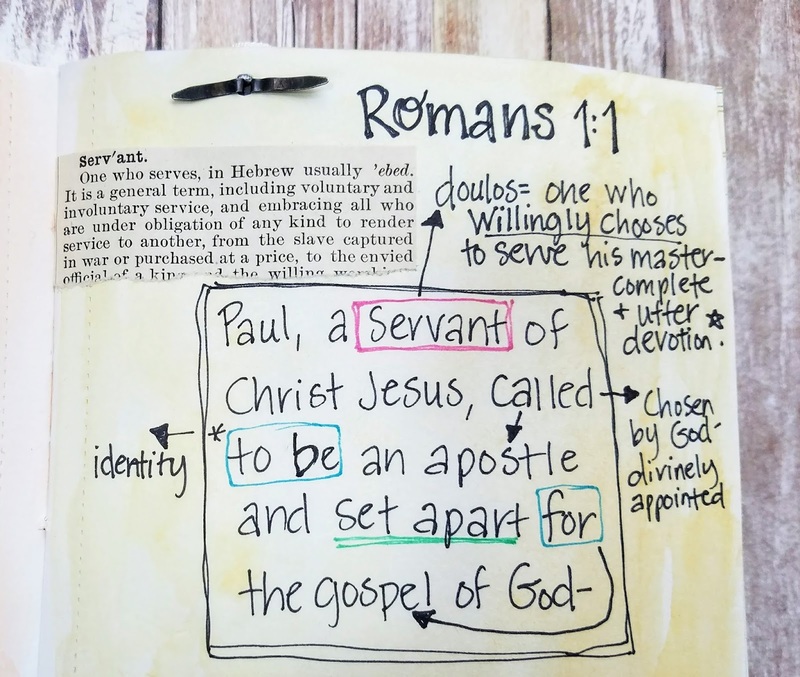 Paul says he is a servant of Jesus Christ. He uses the Greek word doulos which means one who is bound to another; a slave or bondservant, but one who willingly chooses to serve his master. Leon Morris, in his commentary on Romans, says the term conveys the idea of complete and utter devotion. The person Paul is wholly devoted to in complete service is Jesus Christ. Though Paul puts the order Christ Jesus, as in the Messiah Jesus. 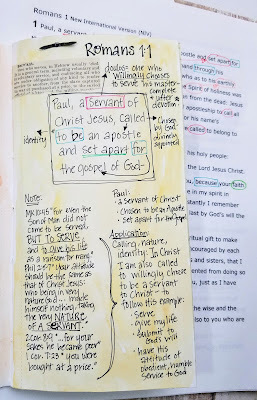 As I studied this word and looked at other passages that speak of servanthood or slavery, what I kept running across were passages that described Jesus' heart of a servant. 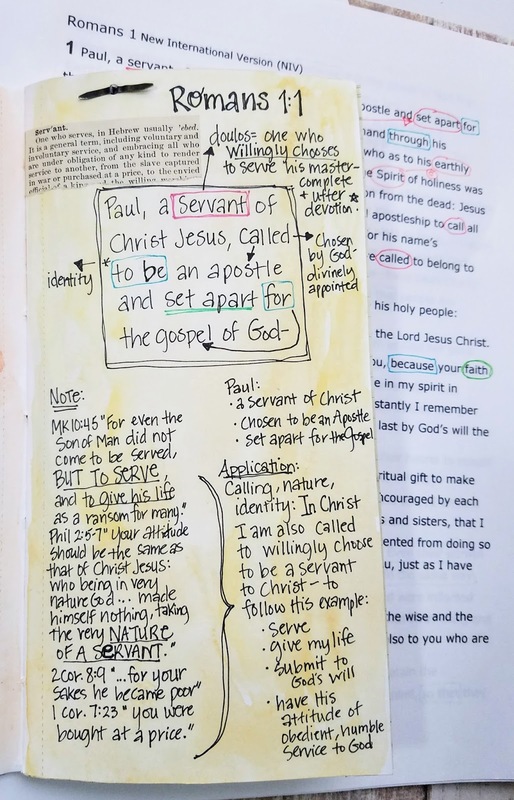 Paul's response to Christ, who gave His life for our sin, was to become Christ's servant, imitating His heart and life - fully devoted and submitted to the will of the Father. Paul reminds us in 2 Corinthians 6:20 and 7:23, "You were bought at a price". We must always remember this and have this as our motivation. To do the will of the Father, Christ took on the nature of a servant and gave His life. We are called to have that same mindset in our lives as Christ-followers. What does that look like in our lives? How do we take on the nature of a servant? How do we give our lives for the will of the Father? We are by nature self-centered and self-serving. Being others-focused and others-centered in ways that are not co-dependent and unhealthy does not come easy for us. We must rely on, depend on, walk in the power of the Holy Spirit. The only way to be fully devoted to Christ and to living with His mindset is to be fully dependent on His Spirit. The other terms Paul uses to describe himself are "called" and "set apart". Paul had a very distinct and memorable calling from Christ on his journey to Damascus. You can read about it in Acts 9:1-19. To be called is to be chosen by God. Morris says, "The called are those who have not only heard but have obeyed the divine call." Those God calls He also sets apart for His divine purpose. 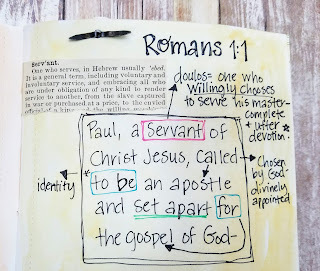 In Paul's case he is called to be an apostle and set apart for the Gospel of God. Paul knew clearly what His divine purpose was. He served God in that purpose with full devotion. "...Live a life worthy of the calling you have received." "[God] who has saved us and called us to a holy life - not because of anything we have done but because of his own purpose and grace." To live a life worthy of God's calling we must be intimately in relationship with Him through His Son, and we must be continually in His Word to know and understand what that holy life looks like.